ITMA is the world’s largest international textile and garment technology exhibition, and the ITMA brand is owned by CEMATEX. ITMA is recognised as the ‘Olympics’ of the textile and garment technology industry – a showcase of the latest technology and a vital meeting place for buyers and sellers from all over the world. In recent years, each ITMA exhibition has covered around 200,000 square metres of gross exhibition space and has attracted more than 1,500 exhibitors from around the world. Each show welcomes a visitorship of over 100,000. Hence, it is always the most highly anticipated textile and garment technology exhibition in the world. Expect to always meet the TMAS members at the ITMA shows. 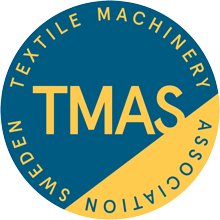 TMAS accompany the Swedish companies with information stands and we hope to be able to greet you personally at the next ITMA trade-fair. The next ITMA will take place in Barcelona, Spain, from 20 – 26 June 2019. For more information, visit www.itma.com.